Integrated Radeon™ R7 GPU for 4K video playback. Two PCIe slots support 10GbE adapters, QM2 cards, USB 3.1 10Gbps cards, or wireless network cards. Use the NAS as a PC by attaching a keyboard, mouse, and HDMI display. Qtier™ auto-tiering technology and SSD caching enable 24/7 optimized storage efficiency. AMD Embedded R-Series SoC uses "Excavator" x86 CPU cores, and supports AMD Radeon™ 3rd-generation GCN and DDR4. The AMD RX-421BD APU, featuring an integrated Radeon™ R7 series Graphics Processing Unit, provides the TVS-873e with the high-end model of the AMD R-Series family. The TVS-873e also provides two PCIe Gen3 x4 expansion slots for boosting the potential for 10GbE network performance. Equipped with a next-gen AMD R-Series RX-421BD quad-core 2.1 GHz APU (Turbo Core up to 3.4 GHz) with up to 64GB dual channel DDR4 RAM, the TVS-873e enables lightning-fast multi-tasking with low power consumption for up to 1052 MB/s throughput with a 10GbE configuration. With a hardware-accelerated encryption engine with AES-NI, the TVS-873e also provides unmatched encryption performance in its class (up to 960 MB/s with AES 256-bit full NAS volume encryption) to boost system performance, security, and ensuring the safety of sensitive business data stored in the NAS. The sturdy and feature-packed hardware bolsters overall system performance. Coupled with the flexible and expandable architecture, the TVS-873e can fulfill diversified application needs. The TVS-873e features a pair of PCIe (Gen3 x4) slots, allowing for installing optional single/dual-port 10GbE NICs to accelerate applications that demand higher bandwidth such as virtualization, media workflows, and backup/restoration tasks for an ever-growing amount of data; or a USB 3.1 Gen2 (10Gb/s) expansion card for transferring large media files to and from USB storage. You can also insert QM2 cards or wireless network cards to extend NAS functionality. The TVS-873e supports the innovative QM2 PCIe card that allows for adding up to two M.2 SSDs. You can configure SSD caching, or create a RAID 5 tiered storage along with the two M.2 SSDs in the NAS*. As these M.2 SSDs will not occupy any 3.5-inch drive bays, the QM2 card allows you to maximize both your storage capacity and performance. There are also QM2 cards that include 10GbE 10GBASE-T connectivity to provide SSD caching with high-speed network connectivity on a single card. *Note: M.2 SSDs for NAS and QM2 cards are sold separately. The TVS-873e features SSD caching, and also supports optional M.2 SATA 6Gb/s SSDs. Using an SSD cache boosts overall system performance, and is perfect for improving the overall workflow of random IOPS demanding applications such as virtualization. QNAP’s Qtier™ Technology empowers the TVS-873e with auto tiering that further helps continuously optimize storage efficiency across M.2 SSD, 2.5-inch SSD, and high-capacity SATA drives with around-the-clock acceleration. The new Qtier™ 2.0 features IO-awareness that empowers SSD-tiered storage with a cache-like reserved space to handle burst I/O in real time, greatly maximizing the advantages of SSD. Note: M.2 SSD is optional. As M.2 SSD operations can easily generate excessive heat, it is recommended to install a heatsink (from QNAP or a third-party provider) on the M.2 SSD. With its innovative USB QuickAccess port, the TVS-873e eliminates the complications of first-time NAS installation and provides direct access to files stored on the TVS-873e - all without needing network connectivity. Simply use a compatible cable* to connect the TVS-873e to a PC or Mac device, and use Qfinder Pro** to configure it. It is just that easy. You can also assign access rights to users for different folders to prevent unauthorized access to important files. *Users must purchase a USB 3.0 A – Micro B cable or a USB 2.0 A – Micro B cable separately. **Qfinder Pro and USB QuickAccess support Windows 8.0 (and later) and Mac OS X 10.7 (and later). Other versions may require driver installation. The TVS-873e features AMD 3rd Gen GCN architecture with breakthrough GPU performance to support 4K H.264 video decoding and stunning 4K UHD display. It delivers superior real-time 4K and 1080p video transcoding to convert videos to universal formats that can be smoothly played on PCs, mobile devices and Smart TVs. The TVS-873e offers dual HDMI output that support "duplicated" or "extended" desktop configurations. You can connect the NAS to a HDTV or A/V receiver and use the media player in HybridDesk Station (HD Station) with the QNAP remote control (sold separately) or Qremote mobile app to enjoy rich media content and 4K @30Hz videos with the best audiovisual experience. 1. Supported video formats depend on the hardware and software specifications of the devices. 2. At least 1GB shared graphics memory is required for 4K or multiple 1080p H.264 video transcoding and playback. You can configure this setting in "Control Panel" > "Hardware" > "Shared graphics memory"
3. Playback capability and quality may vary due to factors including the original file formats/quality, hardware and software limitations, and output devices. 4. To use Linux Station desktop, Linux Station must be installed from the App Center. The TVS-873e supports block-based iSCSI LUN, and supports VMware®, Citrix®, Microsoft® Hyper-V® and Windows Server® 2012 R2, providing high-performance, reliable and affordable storage solution for virtualization environments. The TVS-873e supports VMware VAAI and Microsoft ODX to increase performance by offloading server loading for ESXi server and Hyper-V respectively, and supports QNAP vSphere Client plug-in and QNAP SMI-S provider with enhanced operational efficiency and management in virtualization applications. Moreover, using the iSCSI Extensions for RDMA (iSER) protocol with a compatible 10GbE NIC helps boost data transfer performance of the TVS-873e as VMware® ESXi storage, providing an essential tool to optimize demanding virtualization applications. Virtualization Station and Container Station jointly introduce a hybrid approach to virtualization. No matter what your virtualization needs are, you can count on QNAP for complete virtualization support. Container Station integrates LXC and Docker® lightweight virtualization technologies. You can download apps from the built-in Docker Hub® to easily import/export container apps and manage access control, enjoying the benefit of easy installation, transferability and high-efficiency. QNAP 10GbE/NBASE-T™ unmanaged switches allow you to instantly upgrade your network environment at a cost-effective price. With a 10GbE network you can enjoy blazing-fast transfer speeds, empower bandwidth-demanding tasks like virtualization, and enable simultaneous real-time access to large NAS-based files using multiple workstations (ideal for video editing and multimedia). QNAP also provide a 10GbE PCIe network expansion card for the TVS-873e and Windows®/Linux® PCs to take advantage of high-speed LAN environments. With modularized multiple applications and functions, QTS enhances management efficiency, personal productivity, multimedia, and much more, making your NAS experience easier, efficient, and more flexible! The new Qboost provides a NAS optimization tool that helps accelerate applications, free up system resources, and schedule applications. The built-in App Center with hundreds of install-on-demand apps realizes far more extensive NAS functionality. QTS breaks the barriers of devices, platforms, and geography to bring you optimized cloud experiences and incorporates advanced features. The TVS-873e centrally stores data and various files, and supports SMB/CIFS, AFP and NFS protocols for file sharing across Windows®, Mac®, Linux®/UNIX® networks. Coupled with Qsync - a utility that turns a QNAP NAS into a safe, high-capacity data center for file synchronization - any file uploaded to the TVS-873e will be made available for all linked devices, such as computers, laptops or mobile devices. You can sync shared folders and team folders for group file sharing, greatly enhancing the flexibility of team projects and collaboration. Files can be centrally managed using File Station, including files from mobile devices and optical disc drives. File Station also allows you to mount a remote NAS, and transfer files between your NAS and public cloud services for greater convenience. QNAP provides a flexible backup and disaster recovery solution to assist organizations in routine backup jobs with greater cost-efficiency and productivity. Snapshots are essential for NAS data protection, and its block-level operation makes it a dependable method for mitigating the growing threat of ransomware. The TVS-873e supports up to 256 snapshots per volume or LUN, and maximum 1,024 snapshots per NAS. With potentially huge storage capacities, high performance, integrated virtualization solutions, and support for snapshots that record the state of the system at any time, the TVS-873e are perfect for backing up virtual machines. The TVS-873e is a highly-efficient data storage center with multiple productivity apps. OCR Converter extracts text from images, helping to facilitate file organization, editing, and searching. Qfiling automates file organization - simply determine filing conditions, set a schedule, and files will be organized and archived based on your settings. The Qsirch full-text search tool features quick file searching and provides Qsirch Helper extension for Google Chrome™ and Mozilla Firefox® to search for files on your NAS when using Google Search™, enabling huge productivity boosts that greatly reduce the time spent looking for files on the NAS. The TVS-873e provides intelligent video management system that assists you in managing real-time monitoring, video & audio recording and playback with a wide range of customizable settings to safeguard your work environment. You can use the Vmobile app to manage monitored channels anytime and anywhere with your mobile devices, or install the Vcam app to turn your device into a network camera to instantly record to your NAS. The TVS-873e also supports QVR Pro (Beta) that integrates QNAP’s professional QVR system into the QTS operating system. You can arrange a dedicated, independent storage space for surveillance data on the NAS and leverage the advantages of scalability and storage manageability from QTS. You need an easy solution to increase storage capacity when running out of space. 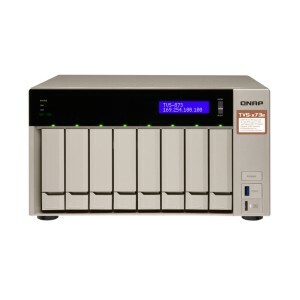 QNAP provides several ways to expand your NAS storage as needed to accommodate data or business growth. Use VJBOD (Virtual JBOD) to expand your storage capacity by using the unused storage of another QNAP NAS. Up to 8 QNAP NAS can be mounted as local disks on the TVS-873e. Hot swap lower-capacity drives with higher-capacity drives so that your QNAP NAS can grow with your business. Install your NAS hard drives into a larger QNAP NAS with more drive bays and retain all your existing data and configurations. The TVS-873e can connect with up to 2 UX-800P or UX-500P, or up to 4 REXP-1000 Pro* enclosures. Use the QTS Storage Manager to easily handle NAS capacity expansion. Enable remote access through NAS browsers to access local LAN resources without going through complex VPN setting. Combines the security and large capacity of QNAP NAS while providing an IoT solution on a private cloud. It only takes three steps to quickly deploy your own IoT application. Install a compatible PCIe wireless network card, and use your NAS as a wireless base station for easy access to NAS services and Internet connection. Simplifies file access, NAS management, multimedia experience, surveillance, and download tasks on mobile devices with QNAP apps. Note: Support 10GbE LAN card, USB 3.1 Gen2 (10Gb/s) expansion card, QM2 card, or PCIe wireless network card.